New, bigger&better scans of the same comic (except text & non-house ads) uploaded almost 5½ years ago. Also now with HAG fc+bc. The first page is still missing, so those 2 scans are the same as before. 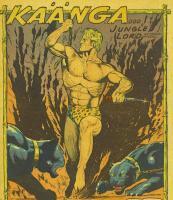 Comment: Page 7 of the Kaanga story is actually a duplicate of page 5. The actual page 7 appears to be missing. Synopsis: Jewel thieves steal the L'homas' sacred jewels and kill their sacred leopard. The L'homas blame Kaänga and Ann. After a brief fight, they leave Kaänga for dead and take Ann to their village for execution; the jewel thieves accompany them. Kaänga recovers and pursues the L'homas. He rescues Ann and exposes the thieves. 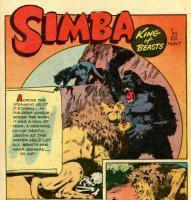 Synopsis: Simba is forced to lead a safari of gold hunters to a cave with gold dust. Synopsis: Using drug addled slaves, Anders is stealing sacred gems from the local idols. Terry and Keeto put an end to his plundering. Credits: Script: ? [as Pierre La Rue] | Pencils: Joe Doolin (p 1); Howard Larsen ? (p 2); Maurice Whitman ? (pp 3-7) | Inks: Joe Doolin ? ; Maurice Whitman ? Synopsis: A brief description of the sources of women's clothing in the jungle. Synopsis: A mad riverboat captain takes a pair of hunters and their animals captive. 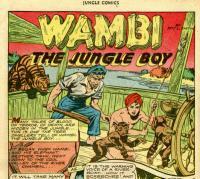 Wambi boards the boat and frees the hunters and the animals. 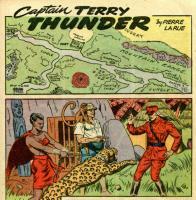 The captain is killed by a tiger. Credits: Script: ? [as Roy L. Smith] | Pencils: Alex Blum | Inks: Jack Kamen ? ; (Iger Shop) ? Synopsis: A crocodile cult takes a pair of white hunters captive. 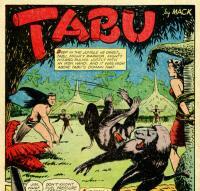 Tabu rescues the pair and leaves the cultists to a pack of mandrills. Synopsis: While investigating a pair of slavers, Camilla is taken. She challenges one of the slavers to a duel on elephant-back and kills her. She then throws the other slaver to the elephants to be trampled. Credits: Script: ? [as Victor Ibsen] | Pencils: Fran Hopper (signed) | Inks: Fran Hopper (signed); Nick Cardy ?